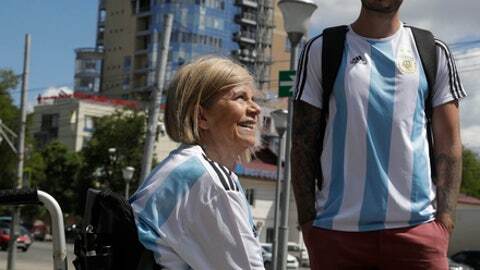 NIZHNY NOVGOROD, Russia (AP) Nothing has stopped Argentine fan Nora Espector from following Lionel Messi wherever he plays. The soccer passion runs in her family: Her grandfather worked for popular Argentine club Boca Juniors. Growing up, he would take her to watch games at the Bombonera, the club’s stadium which translates to Chocolate Box. The 55-year-old Espector is a self-described heart and soul Boca fan, but above all, she feels admiration and motherly love for the Argentina captain and five-time world player of the year. ”I have a son who is (Messi’s) age, and that makes me identify a lot with him,” said Espector, who works in the tourism industry in the Patagonian ski resort of Bariloche. ”I’m touched by his story, and always think about his mom. I always thought he was a special person. Such a down to earth kid, so humble in his way of being, a magical human being,” she said. ”And he’s miraculous as a soccer player. Sometimes, I think we’re not worthy of him” given the way he’s sometimes criticized in Argentina. Messi quit the national team following three successive losses in finals: the 2014 World Cup, the 2015 Copa America and 2016 Copa America. He later returned on a wave of support after fans, players, and even Argentina’s president asked him to reconsider. But he has faced criticism again after the 1-1 draw in Argentina’s opening game to Iceland, where he missed a penalty shot. The two points lost to Iceland also don’t bother her as much, because she says that in her family, ”there’s great affection” for Nordic people. Espector’s former husband and the father of her three sons, is Swedish, and she lived there for two years. This is the third time that she is seeing Messi in person. She also attended a ”clasico” match which Barcelona won 2-1 over Real Madrid in 2013, and a game in 2016 against Deportivo La Coruna, where she stayed in the same hotel as the players of the Catalan club. That time, she got to see the Argentina captain up close. ”I couldn’t believe it. I was so emotional that I broke down in tears,” she said. ”She can read a lot (in Cyrillic), and that’s very helpful to us,” said her son, Emil Davisson, 26, who also works in the tourism industry in Bariloche. The mother and son rent cars to travel to the cities, and park close to the stadium with special permission. ”The (World Cup’s) organization is very good,” Davisson said. ”Going to the stadium is not that complicated, the hotels and transportation part is more complex,” said Davisson, who is the youngest of three brothers. ”Besides the games, we’re thrilled about what surrounds them – the colorful atmosphere. It’s something that transcends scores,” Espector said at the hotel where she is staying in the Russian city of Nizhny Novgorod before Thursday’s Argentina-Croatia game. Although she obviously wants Argentina to win, she says no one should question Messi regardless of the score.